Senior guard Andrew Rowsey poured in 31 points to lead the Marquette Golden Eagles to a 84-64 win over 13th ranked Seton Hall on Tuesday night at the BMO Harris Bradley Center. 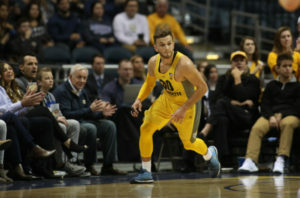 After struggling from the field on Marquette’s recent road trip, Rowsey returned home and scored the Golden Eagles first 11 points and finished the first half with 14 points. Marquette center Matt Heldt held Seton Hall center Angel Delgado in check. Delgado struggled to get on track on the first half and finished with 12 points and 10 rebounds for the game. Heldt countered with nine points and seven rebounds. Rowsey scored Marquette’s first seven points in the second half and he’s gone six games without missing a free throw (33 straight). Sam Hauser added 14 points and reigning Big East Player of the Week, Markus Howard added 12. Marquette improved to 12-5 overall and 3-2 in Big East play.